Photo Credit: Epicore Biosystems and Rogers' Group, Center for Bio-Integrated Electronics, Northwester University (Photo: Business Wire). CAMBRIDGE, Mass.--(BUSINESS WIRE)--LEO Science & Tech Hub, the Boston-based R&D innovation unit of LEO Pharma, has announced a new partnership with Epicore Biosystems focused on exploring the use of a non-invasive, wearable sweat sensor to measure prognostic biomarkers in real time, monitor patient response and inform treatment decisions. The initial project will include a proof of concept study in collaboration with engineers and dermatologists at Northwestern University’s Center for Bio-Integrated Electronics and Feinberg School of Medicine’s Department of Dermatology to establish baseline measurements and milestones to validate the clinical relevance of the approach for patients with atopic dermatitis (eczema). 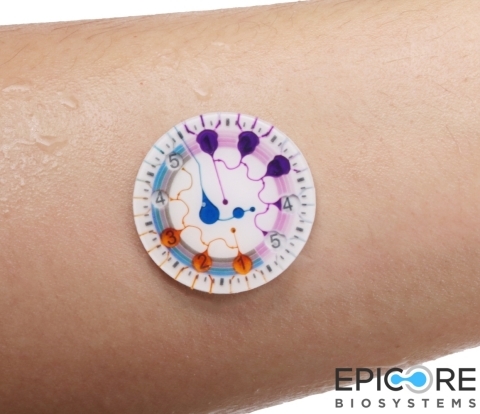 LEO Science & Tech Hub will use Epicore's microfluidic sweat sensing platform to analyze data and improve treatment regimens for eczema patients.